As a veteran social worker, Ellen Moore has seen it all – the vilest acts one person can commit against another. The only thing that gets her through the workday is knowing her job helps children. That, and her family: her husband, Adam, and three beautiful kids, twins Leah and Lucas, and eleven-month-old Avery. But with a blink of an eye – with one small mistake – Ellen is suddenly at the mercy of the system she works for. Avery is ripped from her clutches, and her whole world begins crashing down around her. Meanwhile, ten-year-old Jenny Briard has been living with her well-meaning but good-for-nothing father since her mother left them. When her father decides to pack their belongings and move to a new state, Jenny thinks she might be on the road to a better life. But soon she finds herself on her own, forced to survive with nothing but a few dollars and her street smarts. Evading police and the social system, Jenny finds refuge with a kind-hearted waitress. The last thing she needs is a social worker, but when Ellen and Jenny’s lives collide unexpectedly, little do they know just how much they can help one another. 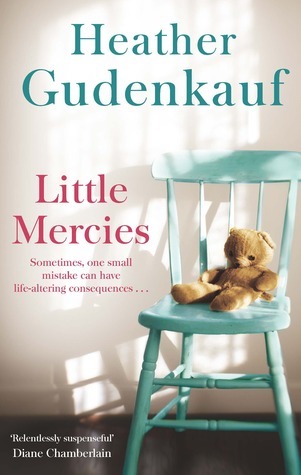 I have read a few books from Heather Gudenkauf, but this one is my favorite. “Little Mercies” drew me in right from the start. Jenny and Ellen were well-developed characters, and I liked that the story was told from both of their perspectives. Although the story was emotional and at times heartbreaking, it was also extremely heartwarming. This was a great story that I highly recommend. I have read a couple of others by her as well and was not to sure about them. I might have to check this one out. Nice review. This definitely does sound like an emotional read. Glad to hear that you recommend it. Great post!